Freezer Peanut Butter Chicken Marinade is a great change of flavors using these ingredients! Here is the second marinade in a series on my blog for the freezer series while I am away on our trip... An Asian flavor we just love this one! This is one of several posts I have done on freezer marinades. Working all day, I want to come home to a tasty meal. Making these ahead of time is the perfect solution. There are several ways to cook them after they thaw, fried, slow cooker, grilled or broiled just to name a few! Peanut butter chicken, pork or meats you prefer is more an Asian taste American style dish. I prefer to make broccoli and white rice as side dishes. You can also make Asian style noodles as another side dish that goes well with this dish. Pork is another meat that taste great grilled with this kind of marinade. I have also tried this with flank steak and chicken thighs along with chicken breast. You can experiment and make whatever kind of meats you like. This freezer peanut butter chicken marinade is pretty versatile for all your meats you like. I love making shish kabobs with this marinade and grilling the meats on skewers. It's perfect for a crowd and a quick fix when company comes unexpectedly. This is a marinade for chicken or pork or any other meat you like. It's placed in the freezer for later uses. Place all ingredients into a 1-gallon freezer zip lock bag. Lay flat in freezer. To thaw and cook: Lay completely flat place in the refrigerator to thaw overnight. Remove from freezer bag when ready to cook. Warning: never thaw out chicken on counter top, as raw chicken can become contaminated. Sauteed: Place in a heated medium size fry pan with 1 tablespoons olive oil, saute' for two to three minutes on each side for thin or longer depending on thickness. Baking: Place on a piece of oil sprayed foil or parchment paper lined baking pan with juices. Bake @ 350 degree in a preheated oven. Around 40 to 60 minutes or until juices run clear. OMG this sounds amazing! It sound like cold sesame noodles. And I am a huge fan of freezer food. Thanks for sharing the recipe. And the answer is - yes, I will be making this. Outstanding. I like peanut satay, so I am sure I would enjoy this one! I am liking this series more and more Claudia. For some reason I bought a ton of chicken last grocery visit, so I am glad to find this recipe! Can't wait to see what's next. II enjoy satay but this sounds so much easier than my recipe and I'm sure with excellent results. My husband could live on peanut butter. I think I will try this one for him. I love satay sauce so I'd have to dress this up with a bit of spice but it sounds yummy! Yum! Almost anything with peanut butter is good in my opinion. This is different though. Sounds wonderful. Love it! I like to toss a marinade in with meat before I freeze it. It makes getting flavour on busy nights so much easier! 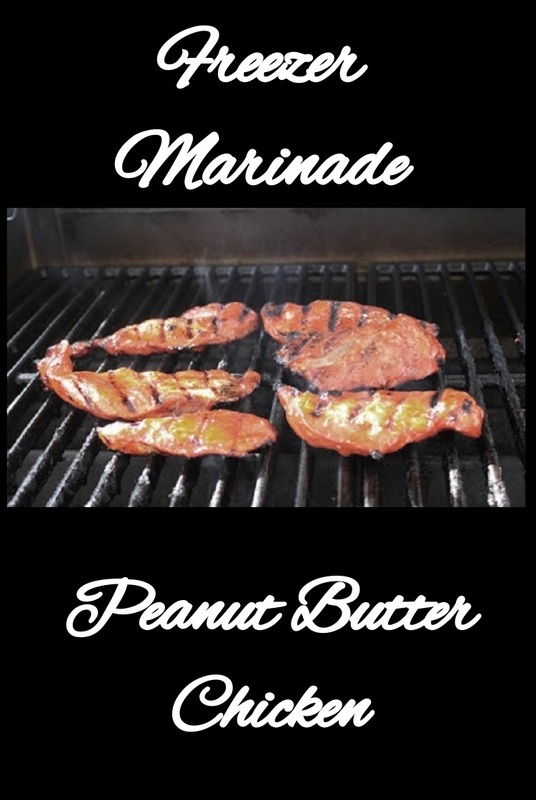 I really love the addition of peanut butter in this marinade. I bet this is delicious! PB marinade is surely my kinda treat. I'm going to give this a try soon. I would not have thought to put those ingredients together, but am intrigued!